1. I have a lot of fabric, but I sew regularly and it makes me happy so I'm not buying into the whole guilt trip thing. 2. I have lots of great fabric and fondling the fabric whilst folding it has given me so many ideas that I have about a millenium worth of projects lined up in my head. 3. I have heaps of grey fabric, which is ok because I make a lot of grey clothes. But weirdly I also have lots of orange and brown fabrics which I rarely wear. 4. I have a real hoarding tendency - I was going to get rid of some fabrics that I know I'll never use, but since I had enough space I couldn't bring myself to do it! 5. There is still some space there on the shelves, so I can't say I will completely stop buying more, but I will try to shop the stash first. Anna would only play in her portable cot for a while before getting cranky, so I propped her up in the washing basket with some lovely soft microfleece and she seemed a bit happier for a little bit longer (it's not child abuse, she's doing some early bonding with fabric!). She still needs to be held most of the time and be given lots of attention though, so my window of getting things done with two hands is still limited. One of the mums in my mother's group is thinking about going back to work because she is bored: she sits around waiting for her daughter to wake up from her 2 hour naps three times a day. I am so jealous to say the least, but I have too many ideas in my head to ever be bored. Thanks everyone for your feedback on the finer details of cloth nappies. I love having such an interactive blog getting advice on all these things because none of my real life friends cloth nappy or sew. Anyway I managed to salvage some of the bamboo fleece that I stupidly made into nappy liners and made some absorbent soakers four layers thick. This, combined with another soaker pad of four microfibre layers seems to give a really good amount of absorbency without too much bulk. In fact last night Anna slept through from 8pm to 5am (yay for small miracles) and her nappy lasted that entire time without any leakage. I finally finished sewing up the nappies for the second time and they work great. I don't think they last as long as disposables between changes, but since nappies should be changed frequently anyway to reduce the potential for nappy rash its not a problem. I'm glad I made the pattern with leg gussets because these are still a little big around the legs even with those chubby little thighs, but Anna will grow into them so they should last for longer this way. I used the Wee Weka pocket nappy pattern sized S-M but from what I've read from other users of this pattern they are big enough to fit until toilet training. As if I don't have enough expensive European sewing magazines laying around the house unused (well read and thumbed through but still unused) I ponied up $23 (eek!) to buy the 2/2009 issue of Ottobre Woman from the crafty mamas website (fantastic customer service from them by the way). After seeing the great creations that Belinda over at Sew 4 Fun has been making for ages, and the fact that this issue had a nursing top pattern I was convinced to try it out. Sorry for the bad photo, I should have ironed the skirt because it doesn't have a seam or crease down the front, it just looks that way. Also I have lost the legs to my dressmakers dummy somewhere along the way between it being stored at my parents house and now being moved into my sewing room, which is why it is sitting funnily perched on the edge of my desk. I used Simplicity 5914, which is a six panel skirt that I've made several times before for myself here and here. 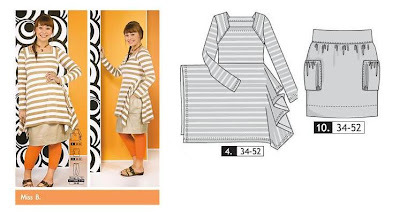 I think it is a good pattern to use when sewing for another person who isn't available for fitting, because with the six panels there are plenty of seams to gradually take the skirt in or out depending on what is needed without affecting the line of the skirt too much. It's also really quick despite having six panels, because it has a facing instead of a waistband and is unlined, although other versions I've made I have lined. 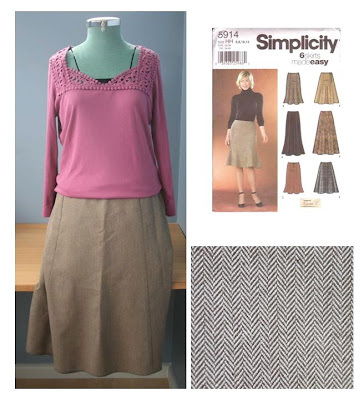 The fabric I used is a light brown houndstooth check of unknown fabric content which was given to me several years ago by my neighbour who is a pattern cutter that works for a clothing manufacturer which must be one of the few left here in Sydney. The good thing about her job is that she often brings remnants of fabrics used in the previous seasons fashions and sometimes passes them onto me - the best kind of neighbour! I'm pretty happy with the way the skirt turned out, and since there is enough fabric left I may just make one for myself. I swore to myself that I wouldn't wear mummy and me outfits with Anna, but as long as I don't wear it when my mum is wearing hers it should be ok! And this skirt seriously took about hour to cut out and sew, so I have time to make it before I delve back into the arduous task of re-making those blasted nappies (the right way this time!). I think I can see a future for two or three of these on my new lounges in the near future. Look out husband, no room for boring or bland interiors on my watch! First up I'll admit I'm no expert at upholstery, having only recovered a few chair cushions and having one success really! But since a few questions were asked in the comments to the last post I thought I'd answer them - a bit of the blind leading the blind, but take from it what you will. Of course there are plenty of upholstery books out there which will probably be a better resource than little ol' me. The wadding I used was just a package of two pre-cut polyester wadding pieces bought from Spotlight for the bargain basement price of $7.99. 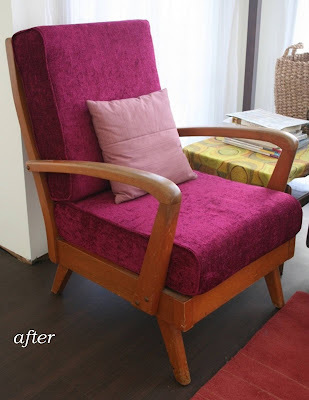 I don't think it is specific upholstery wadding, but it was nice and fluffy and was the right dimensions for what I needed so that's why I picked it. I didn't glue the wadding to the foam purely for the reason I didn't have any suitable glue (a spray adhesive maybe?) to hand, I just roughly hand stitched the wadding down along the back edges and where it was folded over at the corner. The wadding seemed to stick pretty well and the cushion cover holds it all in anyway. I did put zips in the cushion covers so I could wash them if necessary, and with a baby, a crazy dog and a sometimes clumsy husband I'm sure there is more than a reasonable chance of needing to! I just used the longest dress zip I could find because I couldn't any special upholstery zips and anyway the dress zips I used on the green covers that were on the chairs previously held up well. I put the zip in a centred application - basted the seam shut, sewed around the zip in a rectangle and opened up the seam. The colour of the zipper doesn't match exactly, and when someone is sitting on the cushion the zipper is visible, but that's only because it's an open backed chair and I'm not too worried about that anyway. Finally I think the fabric makes a world of difference. The chenille type fabric I used is nice and thick so the stitches sink in and any crooked or dodgy sewing is hard to see! It's also fluffy so less susceptible to wrinkles, and it's nice and warm to sit on. 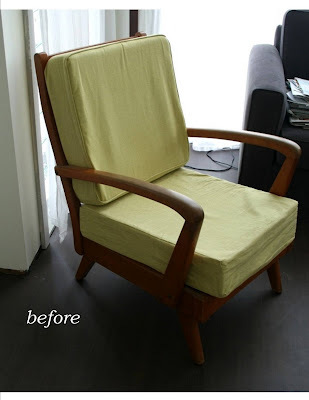 Anyway I hope some of you are inspired to go and give recovering a chair a go, it's pretty boring sewing but an easy way to update your furniture. oooh gotta go, the Bold and the Beautiful is on - my guilty addiction since becoming a stay at home mum LOL! But it hasn't all been mind numbing un-sewing around here, we have been out stimulating the economy and buying new things to decorate the house despite not getting the government stimulus handouts or the baby bonus for that matter since Anna decided to come after 1 January when it became means tested. If she had of come on time we would be $5000 richer, so I've already told my husband we'll garnish the wages of her first job until she's paid it off LOL. Anyway I hope all of you Aussies getting those payments are enjoying my tax paying dollars to their fullest and are out buying things/services that make you happy (*rant rant rant rant*). Two new lounges are being delivered tomorrow, and we bought a new floor rug so I thought I had better get on with making a new cover for an armchair with the fabric I bought that broke my fabric diet a little while ago. Surprisingly it only took two evenings after Anna went to bed, probably because I didn't make any mistakes that needed unpicking (phew!). Now I've just got to give the chair a light sand and restain with a dark teak oil, and recover a matching foot stool as well. I also have some buttons to cover with matching fabric and I'm tossing up whether to sew them onto the chair cushions in a tufted style. There is never a shortage of things to do around here that's for sure!